Who doesn’t want to be self-sufficient? As a human being, by-born we all want to be independent. Whatever the reason behind this! It may be financially, either personally or nationally. When it’s about to be independent in financially, a man starts thinking about earn. There are many ways of earning in the world. But most of the people want to make money in the shortcut way. At that time, the concept of part-time business came. Anyone can do the part-time business in spite of having a profession. Because here he gets the opportunity of flexible working hours. Besides earning extra money, one can develop his own business. That’s why nowadays people are getting motivated for a part-time business. If you can master the art of scaling a part-time business idea while keeping your day job, you’ll have no barrier in the way of your success. When the topic on business comes, automatically investment will come. At that moment people started to scare! There is a wrong concept about this, which is without large investment business cannot be run. But where there is a will there is a way, everyone should not forget that. And YES! Obviously, it is! 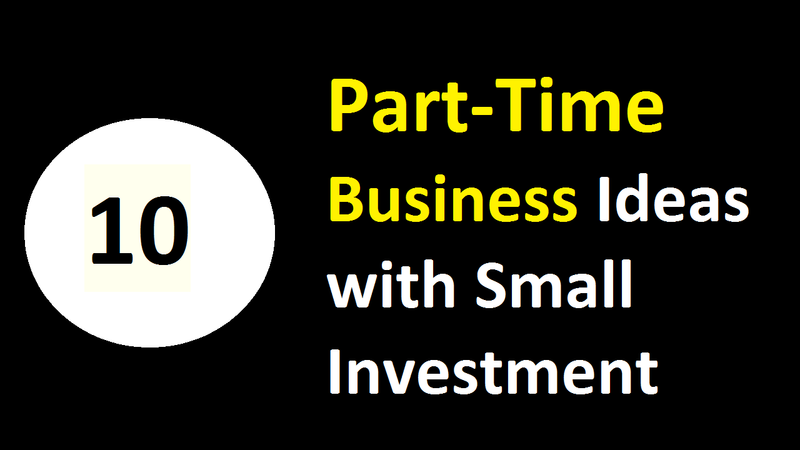 By a little investment, to run a part-time business is possible. Then what are you waiting for! Need some ideas to boost up? Well, now I am going to help you with 10 Ideas! To generate these ideas you just need to know about your competitors and to fix your budget. Besides these two, you have to keep in mind that how much time you can spend on the business. And this is very important for the first starter. Nowadays it is a new trend for the people to hang out in the city. While roaming, they prefer to have some food which is reasonable in price and easily can be found. For this purpose, the popularity of food cart is increasing drastically. Though there is a lot of food cart, there is no risk in this business. Moreover, this business can be started with an affordable investment. Everyone has different potential inside them. To use that skill for profit is a common trend with all of the best part-time business ideas. As one person doesn’t have all the skill, it drives him to gain that skill to add extra value to his life. At that moment, people are willing to pay to become an expert in your field—just like you. If you want to turn your skills into online classes you can help those people who are willing to learn, as well as you can earn a good amount from this business without any investment of money! You can start with a dessert shop as it is very easy to make and also people of all ages are fond of it. You can sell cake, pastry, biscuits, cream rolls etc. These items can easily make in a home with a low investment. But the profit is good. Today’s job market is very competitive. There are many candidates who fight for only one post. So to get the desired job, first and foremost task of the candidate is to prepare an appropriate resume. You can provide those resume writing service. This business is not that much hard to do. You just have to be updated with the job market. That’s it. People love to travel different places to explore the beauty of nature. But everyone is not capable of having knowledge about all places. For this reason, he needs the help of a guide. Every year many tourists plan to travel. To become a travel guide can be a good choice as a part-time business. Who wants to lead the monotonous life? No one. Everyone likes changes. That’s why interior designer becomes a profitable part-time business in the market. You just have to understand the expectation of the customers and need to have the taste of style. That’s enough to run the business. To save the time, people want to have their purchased products on their doorsteps. And home delivery services provide this facility. To start this business, you have to be good at time management. It would add more value if you are able to travel through any medium. With a very low investment, you can add makeup skill to your part-time business. This business can be done based on both media of online and shop. A wedding ceremony is a very special moment for the bride and the bridegroom. Every couple wishes to make that moment memorable for their whole life. As a part-time business, anyone can do this. Customers’ satisfaction is the key to this business. There is no one who cannot take pictures. With this skill of photography, people may start a part-time business. For that, you have to have a quality-full camera and have to shot pictures of your surroundings to enrich your portfolio. This will help you to run the business smoothly. All of these ideas will lead you to the way of your dream of being self-sufficient financially. Moreover, you may able to be a successful business person with the help of your part-time business. Thus you can start a part-time business anytime whenever you want and can earn money with less investment.